Most of you must have heard of the term 'placebo' - an ineffectual/fake medicine that is used to deceive the patient into thinking that it will cure him or her. Almost like magic, and guess what, it actually works many times. It's more or less an instrument of faith. 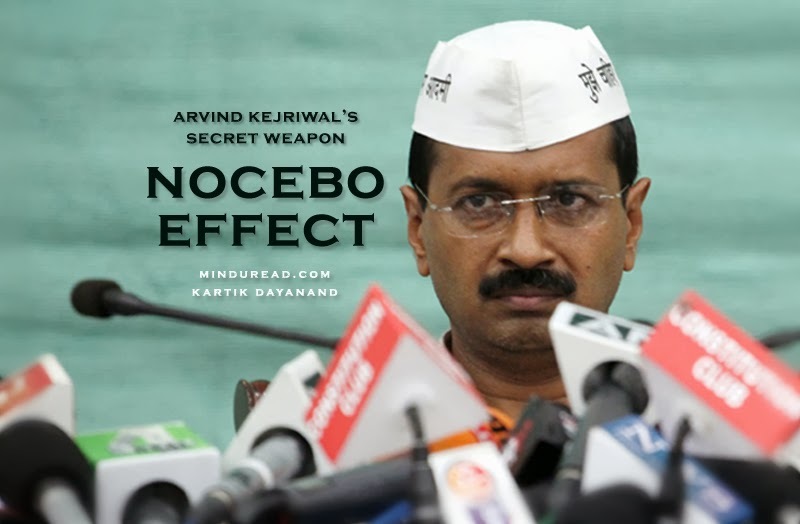 One does not have to carefully analyze or interpret any of Arvind Kejriwal's speeches or interviews to see where the Nocebo Effect comes into play. He has a clear black and white agenda - "they are bad", no, it is actually…"THEY ARE ALL BAD. I am good, I will clean up the system, you help me in cleaning it up. Who am I? A nobody. An ordinary citizen like you, but they, the politicians...THEY ARE ALL CORRUPT, they are looting our country, sab chor hai, sab brasth hai". These are obvious takeaways from any of his speeches and we don't need rocket science to understand that. In Arvind Kejriwal's dictionary Mukesh Ambani is running the country and Reliance is looting the nation. Congress and BJP are the Ram Lakhan of corruption. The Delhi LG is an agent of Congress. Dynasty politics is dangerous. Your electricity bills are inflated, don't pay them. Don't do this. Don't do that. Where is the proof for anything? None at all, at least until now. Yet, lots of people believe him blindly. Part of the problem lies with the demographic he seems to target the most, the aam aadmis, the rickshawalas, the ones living in the slums, the frustrated middle class, the ones who believe in placebos (promised by earlier governments) and the ones who unknowingly are victims of the Nocebo Effect. Thanks to the huge economic disparity between them and the well to do, the aam aadmi believes he is being deprived and has every right to be anti establishment. And guess what - they are the ones who actually go out and vote. Who will match Arvind Kejriwal? Who will tell the citizens of Delhi the truth? Despite her support for the BJP openly, her anguish over how things were turning out with AAP was very visible. There is no easy way in which one can counter the Nocebo Effect - a lie told a thousand times becomes the truth they say, and AAP is reaping the full advantage of this. History on the other hand is proving to be the single biggest enemy of both the Congress and the BJP. They have been in power earlier and no matter how much they try, they are the system and Arvind Kejriwal is hell bent on making everyone question the existing status quo. No matter how many big budget advertisement campaigns the Congress runs, or for that matter even if they have done some good work in the last 10 years, they are bound to become the biggest victims of this Nocebo Effect. BJP also has been criticizing Congress, and vice versa. There is a partial Nocebo Effect in play there too. But when two biggies fight, that is routine. The real drama happens when the newcomer challenges the big guns. And we all know - the underdog usually has our support and more importantly - sympathy, which can translate into votes. AAP will continue to be the destructive force whose only agenda right now is to upset the apple cart. Whether we shall have any apples to eat after that is a subject for another day and another blog post. This post also appeared on 'The Times Of India' website - click here to read the post as well as the passionate reactions the post evoked over there!